The editing and building of the beta manuscript for my fantasy novel “An Easterly Sojourn” (working title) is going well so far. I believe we (the Queen and I) have gotten through the most difficult chapter yet. The challenge stemmed from morphing two separate chapters into one. Apparently, chapter 17 (On the Edge of Jalken) had nothing happening, but it contained some wonderful scenes and clever dialog. We realized those snippets would serve to enhance chapter 15 (The Changing of the Guard). Inserting things here and there meant correcting the time and position of the characters. Of course the task turned out to be more complicated than I had imagined. For example, the character Cyril exits in order to speak with a Lieutenant. However, in some of the added scenes, he had returned. Also, some characters start in the rear of a wagon, and then are suddenly either on the side of the road or in the driver’s seat. These continuity quirks had to be handled along with the regular editing process. The original draft had 28 chapters. But now that we’ve blended two of them, that number is down to 27. Therefore, I can happily report that the beta manuscript has 15 of 27 chapters completed…almost home. Tell me about your Works In Progress (WIP). Have you ever had to make continuity corrections from putting together pieces from different chapters? As some of you know, I had to stop #writing on account of moving across the country. In recent posts, I’ve made it clear that I was back again, blogging and writing my #fantasy novel “The First Light.” I even hammered out a new short story as well. 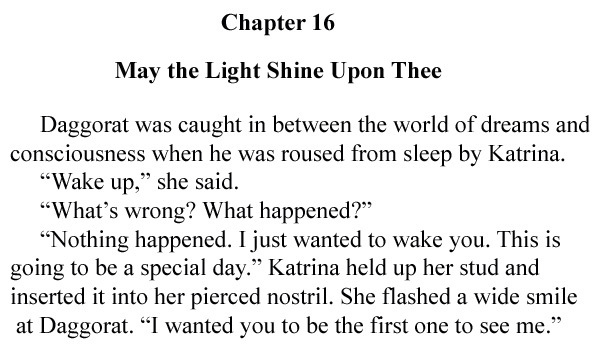 I was able to complete chapter 16, “May the Light Shine Upon Thee.” It’s a fun and happy chapter despite its rather serious-sounding title, which comes from a ceremony that is performed within the chapter. The subsequent celebration and feast are the elements that give this particular segment its light-hearted flavor. As I’ve mentioned in previous posts, I was deathly afraid of a dreary “Act II Malaise” taking hold of the story. However, I’m pleased with the pace. So far Act II ( chapters 11 – 19 ) has some great revelations, action, comedy, romance, mystery, and overall good times, sprinkled throughout its pages. I’d love to you all more about it in detail, but then I’d be giving too much away. How are you handling your version of a second act? Chapter 14 “Fork in the Road” of my upcoming #fantasy novel The First Light is now complete. However, after getting that first draft down on paper comes the point where I look it over for any glaring errors. Yep, I found one. “Fork in the Road” by Jack. Used under Creative Commons License. The fact is I failed to address any of those issues. This wouldn’t be classified as a plot-hole, but might well leave a reader feeling that the story isn’t plausible. Rest assured that these issues have been addressed and explained, without creating a bulk of exposition. It was interesting to work my way through them, to really think about the capabilities of horses and wagons, and the logistics of travelling alone on a dangerous road. 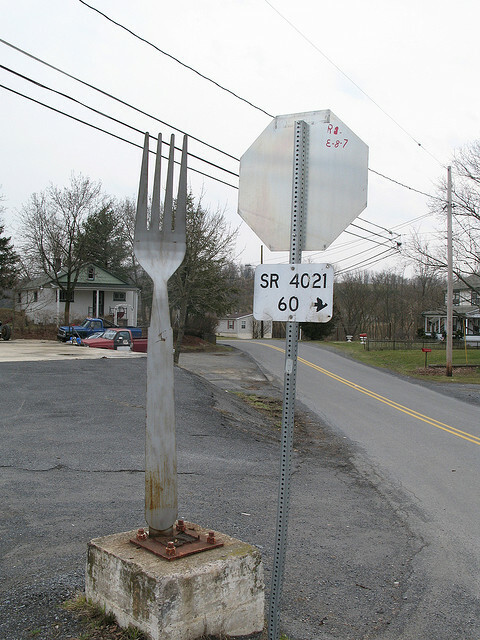 As for Chapter 14, there is no literal fork in the road; I used the term figuratively. The main character’s next course of action is a major decision, from which there is no going back. Another fork is the relationship between my MC and a minor character. Will their romance survive their first lovers’ quarrel? I haven’t decided yet. So it seems like I’ve come to a fork in the road as well. Isn’t it interesting when author and character are experiencing the same things? 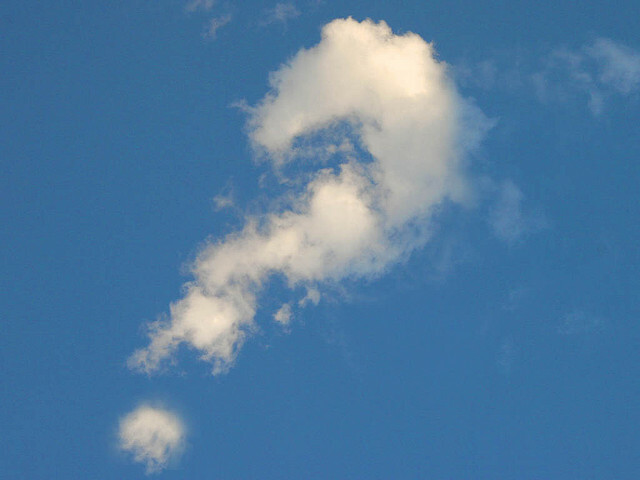 What kinds of issues have you faced in making your novel completely plausible and hole-free? If you’re either a reader or an author of fantasy then it’s a probable bet that you’ve read The Lord of the Rings by J.R.R. Tolkien. You may remember with a smile words like taters, olyphaunt, pipeweed, and eleventy-first. 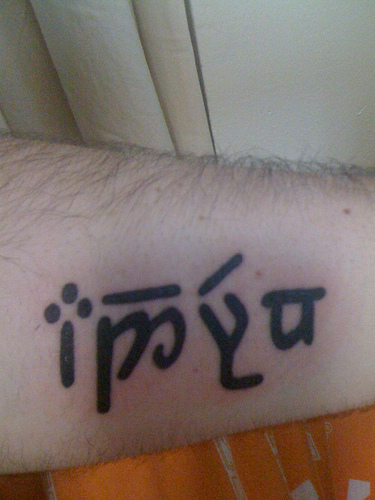 It was this precise nature of playing with words that brought Middle-Earth to life in a very special and unique way. “J.R.R. 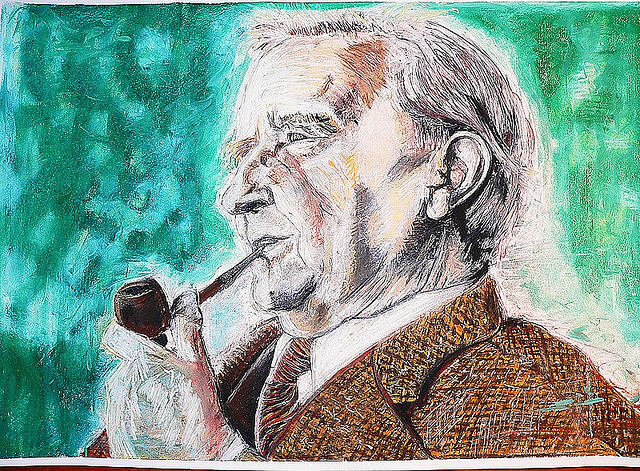 Tolkien, Da Morto” by Daniele Prati used under Creative Commons License. As part of fantasy world-building, other authors must do the same but in our own way. We should learn from Tolkien and create a #writingtip for our usage. However, we must define what is special about the words. Firstly, you just can’t make up some strange word that is going to act like a speed-bump to the reader. You didn’t need a glossary or a long winded description to recognize “pipeweed”. You knew what it was and recognized Tolkien’s playfulness the second you read it. Now, the world-building in Science Fiction can be a little different. Remember the tachyon particles from Star Trek: The Next Generation, and how often they were used in the series? People had no idea what a tachyon was; yet, their nature never really had to be explained. #Sci-Fi fans (including myself) just accepted it. Did you pick up on the meaning of flatcakes, roundcakes, porklogs, and nobnoggins? Readers in the U.K. will recognize banger as sausage, while U.S. readers may not. However, from the use of porklog, the reader should be able to infer the meaning of sausage. Of course, The First Light is not laced that heavily with this type of vocabulary. You’ve just witnessed its most concentrated use in Chapter 1. I don’t do this again until another tavern scene in Chapter 7 and again in Chapter 14 when some characters are studying a map. I couldn’t use the word “geography” in the world of Tyrhennia, so I made up the word “tyrhenostrophy”. How do you feel about word-play for the sake of world-building? The April version of NaNoWriMo struck a few days ago. I admit that I didn’t get anything done on the first of the month. However, over the past few days I finally put the finishing touches on Unlucky Chapter 13 and have since broken into a streak. I’ve completed a major chunk of Chapter 14, called Fork in the Road. Within this chapter, I’ve created (what my editor and I believe to be) some of the best comic relief in The First Light. Yes, there are reasons to giggle and snort in previous chapters, but this scene is much more extended than the other punch lines dabbled here and there. Some say that author-gods shouldn’t be too cruel to their creations. Yet in chapter 14, my main character is having one of those days, from stinging embarrassment to comical frustration. Anyway, if it wasn’t for NaNoWriMo, and having to Tweet #amwriting, I probably wouldn’t have gotten this done during the week. You see, I’m moving soon and this week was filled with emptying closets and creating garage sale, eBay, and keeper piles of stuff. And let’s not forget the roofers that came by to patch some shingles. A busy week did unfold, but thanks to NaNoWriMo, I managed to squeeze in precious writing time and get something done. What are you working on this April? Has NaNoWriMo helped to motivate you too? When it comes to world building for a fantasy novel, an important step would be the creation of another language. There’s an entire world being presented in a fantasy novel, which means different, races, cultures, climates and geography. Elves can be an important part of any fantasy world. I love them, and refuse to create a world without them. However, I am not going to simple take Tolkien Elves and drop them into my world. Sure, they may look the same, but they will not act the same or have a similar history. Therefore they shouldn’t have a similar language either. I’m a linguistic dilettante, so I can’t resist. I’ve decided that Elvish (Varnya) on my world will be based on a three letter root system, which is of course the basis for the Semitic languages. The language will also be conceptual, and will use prefixes, suffixes, and infixes to create different words while maintaining the conceptual three letter root. I took the Russian word for “word” – Slovo and created my three letter root SLF (“V” and “F” are very similar). Next, I thought about all of the words that could be associated conceptually. Next it’s just a matter of vowels, prefixes, suffixes, and infixes to create all of the necessary words. I’ve also decided that the infixes “la” and “lu” are only for verbs and “doers” of the concept. Therefore, the word for “letter” in Varnya would be Salaf, and “author” would be Salulif. I know that in fantasy novels, created languages can be either a cause for depth or confusion. It’s a fine line to walk. How do you feel about created languages in fantasy novels? Do they help to immerse you into the fantasy world, or do they cause confusion and distance? I breezed through the first twelve chapters of my fantasy novel The First Light. Two of the chapters weren’t even planned; they just grew as the story took on a life of its own. Then chapter 13 came along. In this chapter there was going to be a fight scene and we were going to learn something about one of the secondary characters. I’ve noticed that fight scenes (even from best-selling pros) don’t feel visual enough. In a bind I stumbled across Writing Fight Scenes by Rayne Hall. I gobbled that book right up and made up a few charts from the information that I gleaned. I wasn’t writing a huge battle scene, or an extended fight-to-the-death between hero and villain. It was just a small clumsy attack by non-professionals. Thanks to Rayne Hall, I got through it, and it makes sense (to beta readers anyway). 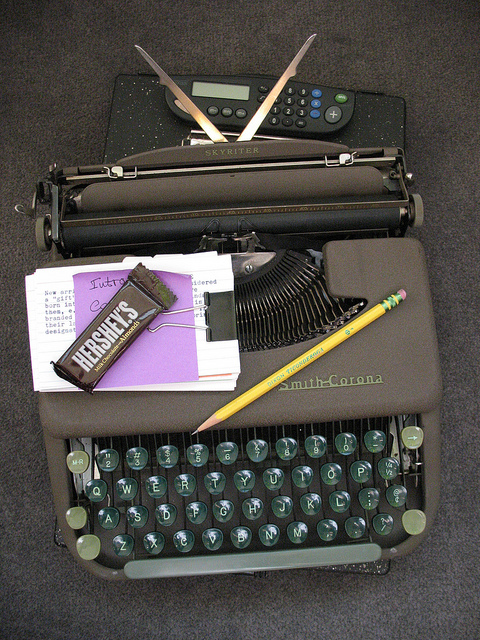 This situation was totally different from (gulp) writer’s block. I was still writing and editing short stories. I even wrote FIGHT SCENE GOES HERE and completed the rest of the chapter. The working title for this chapter is “Assassins”; although, I’ve been toying with the idea of calling it, “Knives from the Darkness”, or something on that order. Have you ever gotten stuck in a predicament like this one? For all who read and commented upon my previous post The First Dozen of The First Light, it should come as no surprise that I’ve since renamed chapters 2 & 4. Originally, chapter Two was called “Contemporary Antiquity,” which does fit because it reveals part of the history of Tyrhennia – a history that has ramifications for the current day. Of course, the key word is “part,” and that’s why the title irked me. I’d love to call the chapter “True Confessions” but alas, that’s the title of a major film from 1981. Horrid thoughts about Robert DeNiro banging on my door and screaming “Are you talkin’ to me” made me drop that idea. I could use the word “Confessions” alone, but it isn’t very descriptive and sort of swipes an ancient title from St. Thomas Aquinas. (Catholic guilt alert) God knows that I don’t want to steal something from a Saint, and have Sister Attila the Nun smack me across the knuckles with a huge wooden ruler. However, in the chapter, two characters do reveal something important to each other. Therefore, “Mutual Confessions” seems to be the winner. I presented Chapter 4 to my critique group this past Saturday, and they all agreed that “The Creeping Shadow” was not a good title. In this chapter we get our first glimpse of the Tenebrae, and learn about how patient they are at implementing their plans. However, much more is revealed about the personalities of two dark mages, Lamortain and Xymphilia (I think she’s getting a name change as well). They’re twisted, psychotic, and utterly violent. The manner in which their evil is shown within the chapter led a critique reader (Colt) to propose the new title “Lightning and Fire.” I think I’ll stick with it. Thank you Colt, it’s so good to have author friends. Do you perform mental gymnastics when creating chapter titles and character names as well?